Sea ice off Antarctica and in the Arctic has shrunk to record lows for this time of year. Or, to put it another way, an amount of polar ice bigger than the size of India has vanished. In recent years, the amount of Arctic sea ice has been declining, while ice in the Southern Ocean off Antarctica has been expanding. But in a worrying development, sea ice is now retreating at both ends of the planet as global temperatures rise. Scientists think a combination of a build-up of man-made greenhouse gases, an El Nino event and freak natural swings in the weather might be contributing to the unexpected effect. "There are some really crazy things going on," Mark Serreze, director of the US National Snow and Ice Data Center (NSIDC) told Reuters. Globally, 2016 is set to be the hottest year on record, and in parts of the Arctic temperatures were 20 degrees Celsius above normal some days in November, Serreze said. The total extent of polar sea ice on 4 December was about 3.84 million square kilometres below the 1981-2010 average, according to NSIDC satellite measurements – or an area bigger than India. 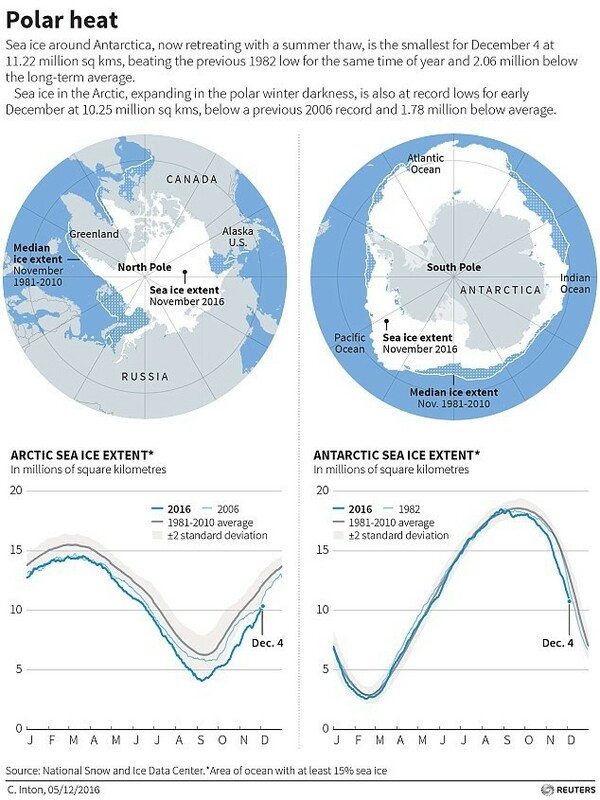 The figures show Arctic sea ice is at a record low for early December of 10.25 million km sq. That's 1.78 million km sq less than the long-term average. At the same time, the amount of sea ice around Antarctica is at its lowest levels for the time of year, at 11.22 million km sq, and 2.06 million km sq below the long-term average. Serreze told Reuters the twin record lows might be “blind dumb chance”. But the worry was that “Antarctica is the sleeping elephant that is beginning to stir”. What's happening at the South Pole? In recent years, Antarctica's sea ice has expanded, prompting some climate sceptics to question whether global warming is, after all, man-made. Scientists think that the icy winds that whip around the continent might have helped to protect it against the effects of global warming. John Turner of the British Antarctic Survey said these westerly winds were the weakest for November in two decades, which might have allowed more heat south. The healing of the ozone layer over Antarctica, which led to cooler air over the continent when it was thinned by now-banned chlorofluorocarbon (CFC) chemicals, may also be a factor, he said. But Turner added that it was hard to be certain about exactly what had caused the rapid shrinking of ice in Antarctica. Scientists have been studying changes to Antarctica's ice sheets for decades, and are concerned that the region's glaciers could melt more quickly, contributing to global sea level rise. Ice shelves are the floating parts of glaciers, and help pin back grounded ice. When they collapse, the ice behind them falls into the ocean more quickly. 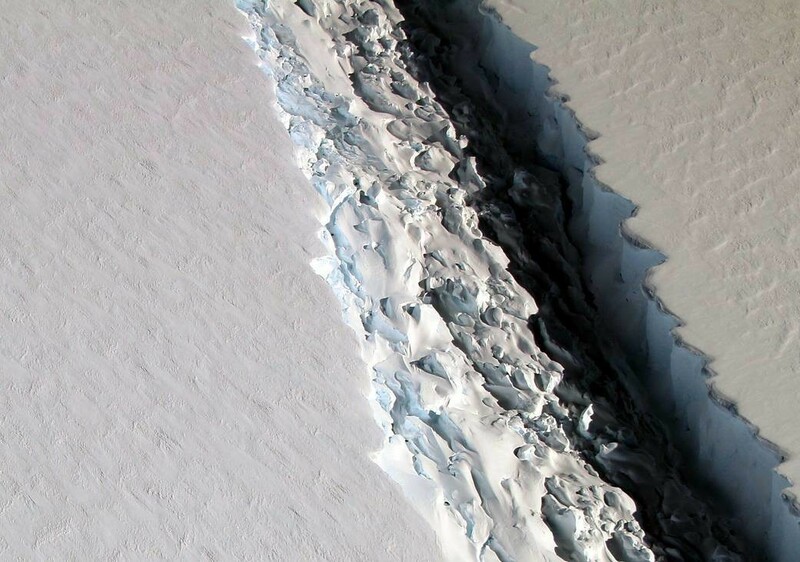 Back in 1995 and 2002, chunks of the Larsen Antarctic ice shelf, known as Larsen A and B respectively, collapsed. Now NASA scientists have photographed a huge crack in Larsen C, the last complete part of the shelf. The rift is about 113 km long, more than 90 metres wide and about a half a kilometer deep. The colossal slab of ice is expected to fracture off Antarctica's peninsula and produce an iceberg the size of Delaware before it breaks up entirely.